How does the Hydrosense Legionella Rapid Test work? The Hydrosense test uses Lateral Flow Immunochromatographic Assay (LFICA) technology. The test is designed to detect Legionella antigen, using antibodies tagged with red nanoparticles, which bind to any Legionella pneumophila sg1 bacteria found in a sample and make them visible as a line on the device. In simple terms, the test works just like a pregnancy test, except it detects Legionella antigen rather than pregnancy markers. The Hydrosense test uses Lateral Flow Immunochromatographic Assay (LFICA) technology. The test is designed to detect Legionella antigen, using antibodies tagged with red nanoparticles, which bind to any Legionella pneumophila sg1 bacteria found in a sample and make them visible as a line on the device. In simple terms, the test works just like a pregnancy test, except it detects Legionella antigen rather than pregnancy markers. Does the Hydrosense Legionella Test detect all species of Legionella? The test is specific to Legionella pneumophila serogroup 1(SG1). Legionella pneumophila is responsible for 97% of Legionnaries’ disease and SG1 causes 91% of the Legionnaires’ disease caused by pneumophila*. L. pneumophila SG1 is by far the most prevalent, virulent and deadly type of Legionella and the most important to detect quickly to mitigate risk. The ability to detect L. pneumophila SG1 rapidly is extremely useful in preventing outbreaks of Legionnaires’ disease, and the Hydrosense Legionella field test provides “early warning” information on the presence of this high-risk organism. This means that steps can be taken to control Legionella bacteria quickly, thereby reducing the threat to human life, days before the laboratory could even provide a preliminary positive result. Does Hydrosense Legionella Test have any validations? The Hydrosense method has been recognised and independently validated by both commercial and research institutions around the world. The Dutch Water Research Institution (KWR), compared the test with lab culture and PCR methods and stated that the Hydrosense test is a useful addition to the set of instruments for the daily management of cooling water systems. It also mentioned that its speed and simplicity make it exceptionally interesting for monitoring in emergencies. UKAS Accreditation– UKAS accreditation is only available to laboratories. It is possible that a UKAS accredited lab could carry out the Hydrosense Legionella field test. In fact, many of them do. However, since the rapid testing is carried out on-site, which is, of course, one of its biggest advantages, UKAS accreditation is not applicable. CE MARKING– Many products sold in the EU carry a CE mark which indicates that the product is in compliance with European Directives. At present, there is no EU directive on any Legionella water tests. As a result, CE marking is not applicable. Can several samples be analysed at the same time? 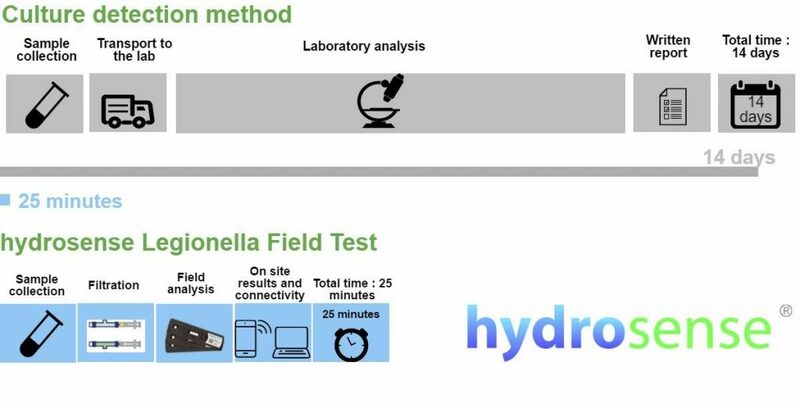 Yes, the Hydrosense Legionella Test is highly efficient for testing multiple samples in parallel and takes only 25 minutes to provide results. The filtration process typically takes well under 5 minutes. Several samples can be collected, and multiple different tests can be performed simultaneously. Can the Hydrosense Legionella Test replace the laboratory culture method? Almost every regulatory framework in the world recommends the use of the Laboratory Culture method. This is principally due to the fact that technique has been around for a long time so is well understood. However, the latest version of the ISO Water quality — Enumeration of LegionellaLab Culture standard (11731:2017) states that recovery rate of the laboratory test is “ > 64%”. Meaning that up to 35 out of every 100 samples tested even in an ISO accredited lab could produce a false negative result. In non-accredited labs this number is likely to be much higher. Hydrosense’s recovery rate is over 80%, 15% higher than that stated in the ISO document. Additionally, the Lab Culture method is unable to detect Viable but Non-Culturable (VBNC) forms of Legionella bacteria which can still infect human lung cells. Hydrosense detects VBNC bacteria. A positive Lab Culture result is a positive result two weeks too late – by the time the result is received people have been at risk of infection for two weeks. Conversely, a negative Lab Culture result provides a false sense of security as Legionella populations can double in 24 hours or less. A result from two weeks ago is a view of the past which holds little, if any, meaning for today. Hydrosense can provide results in 25 minutes, in fact, a positive result is sometimes visible much faster than that. If your local regulatory compliance framework or water system circumstances dictate that lab testing is required, then you must carry out a lab test, in which case the Hydrosense test should not be used as a replacement. However, considering the factors mentioned above, it is unwise to use the lab culture method in isolation. Hydrosense recommends that more than one test method should be used (whether Lab Culture, Hydrosense or PCR) in order to effectively protect businesses, their employees, customers, and the general public from the risk of Legionnaires’ disease. Our customers often use the Hydrosense test in addition to periodic lab culture tests and as a part of an overall risk assessment to minimise the risks of Legionella exposure. What business sectors use the Hydrosense Legionella Test? Legionnaires’ disease presents a significant risk to public health and as such, in many industries, the control of Legionella bacteria is carefully regulated by specific health and safety law. Can I do the Legionella test myself? Yes, The Hydrosense Legionella Test is very easy to conduct and with the help of the instructions included in the kit, and instructional videos available online, everyone can perform the test. Interpretation of the test results is also very straightforward. One line indicates a negative result and two lines indicate a positive result. The test can be read and recorded using the Smartphone reader app, available to download for free from the App Store. When to test for Legionella with the Hydrosense Test Kits? Routine monitoring of water systems –If a water system is infected, then the faster this is identified, the faster corrective action can be taken. Many guidelines rely heavily on the risk assessment procedure, which requires that testing regimes are tailored to specific circumstances of the water system. Checking systems where control measures have gone out of conformance – When cold water is not sufficiently cold, and hot water is not hot enough to prevent Legionella growth, or when biocide levels are too low, a system may become rapidly compromised. The real-time water safety checks can allow for quick identification of risk and instant remedial action. Checking after a disinfection treatment– Once an infected water system has been treated, the faster it can be confirmed that the treatment has been effective, the faster everyone can get back to work. It also allows service providers to show their customer that the treatment has worked, offering them a peace of mind. Identifying the source of an outbreak –If there is an outbreak it is important for both public health and for legal reasons to establish the source as soon as possible. The Hydrosense test can provide immediate detection and allows duty holders to take immediate remedial action. A positive with Hydrosense can ensure people are protected from a source of infection in minutes rather than continued exposure while water management professionals are waiting for Lab Culture or PCR results from a Lab. In any environment without easy access to a lab –For many sites with critical water supplies, it is difficult, if not impossible, to send samples to a lab for testing. For example, on ships and offshore facilities like oil rigs, on-site testing provides easy and invaluable results that cannot be obtained from the lab. How often should I test for Legionella? Legionella testing frequency will depend on regulations in your industry and region, your company specific water safety plan and the level of risk facing your organisation/ facility. For instance, hotels and medical facilities will have a much higher risk than office blocks because of more complex water systems and, in the case of medical facilities, the presence of more vulnerable people. Where should I take a sample from? You can also visit our Legionella high-risk sectors page for more information. Do I need to wear protective equipment when performing the test? You should follow Water Safety Plan recommendations for the collection of water samples for Legionella. However, when using the Hydrosense test no particular precautions are required. The filtration step in some kits captures any bacteria in the sample thus reducing risk while taking the test. When collecting a water sample, you should avoid being near or creating aerosols (showers and spray). Do I need any special equipment to perform the test? All of the equipment you need to carry out a test is included in the kit provided. How to store the Hydrosense Legionella Test ? The tests should be stored at room temperature, preferably below 30°C (86°F). The tests can be exposed to slightly higher temperatures for short periods of time but should be returned to room temperature as soon as possible. The test should not be frozen. The tests come packed in a waterproof foil wrapper, which must be undamaged. Damaged wrappers mean that the test may have been compromised and must not be used. How to dispose the Hydrosense Legionella Test ? Used tests can be disposed of in normal waste procedures. The tests, even when exposed to Legionella, does not pose a risk of infection as sprays or aerosols cannot be created. On the instruction leaflet that you receive with each test kit, you will find a full list of components that can and cannot be recycled. Do I need any special training to use the Hydrosense Legionella test? No. The tests are simple to use and no special training is required. Please see the video clips on the website which take you through the execution of the different types of tests. A negative test result indicates that LpSG1 antigen has not been detected in your water system or that the concentration was below the limit of detection. A positive Hydrosense Legionella test means that Legionella pneumophila SG 1 (LpSG1) antigen has been detected in your water system above the limit of detection for the test kit used. As a result, your employees, clients and the general public are at risk. You should follow your Water Safety Plan recommendations, contact your water management specialist or clean your water system immediately. What should I do if Legionella has been detected? If Legionella has been detected in your water system, your staff, customers and the general public are at risk of contracting Legionnaires’ disease. This can have very serious consequences for you and your business. It is recommended to follow your Water Safety Plan recommendations, contact your water management specialist or clean your water system immediately. What is the shelf life of the Hydrosense Legionella Test ? The shelf life is 18 months from the date of manufacture when stored at below 30°C. If you are concerned about the shelf life of the product, please discuss your requirements with the Hydrosense team member, before placing an order. 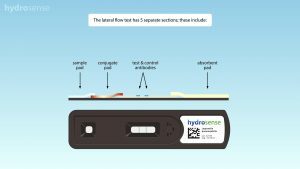 How can I buy the Hydrosense Products? Can I resell the Hydrosense Legionella Test Kits? What support will I get to obtain local accreditation?